Walton’s Dachshunds is located in rural Western New York. 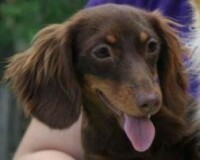 We are breeders of AKC miniature and small standard dachshunds in most colors and patterns and all three coat types. Our puppies are raised in our home in a warm, loving environment with lots of attention and affection from all members of our family. We strive to provide you with an adorable, healthy, playful puppy that will be a treasured member of your family for many years to come. We like to think they go from our lap to yours! We are fully compliant with the American Kennel Club, and we are licensed by the New York State Department of Agriculture and Markets. We have no pups available at this time. We don't currently have any upcoming litters but hoping that will change very soon! Jake and I wanted to thank you for Cosmo! He is the best puppy. He is so playful and sweet-the perfect addition to our family! !